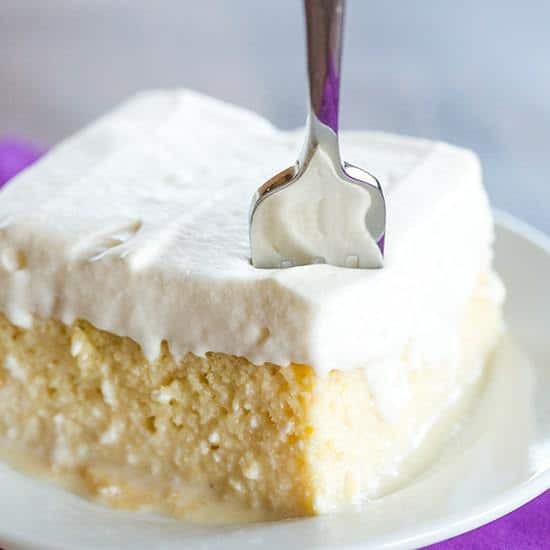 This Tres Leches Cake recipe is simple, easy and delicious! Are you celebrating with copious amounts of salsa, guacamole and margaritas today? I’m totally craving tacos! However, I’m skipping over dinner today and going right to dessert… this tres leeches cake, to be exact. Have you ever tasted one? It is quite possibly the world’s best poke cake. 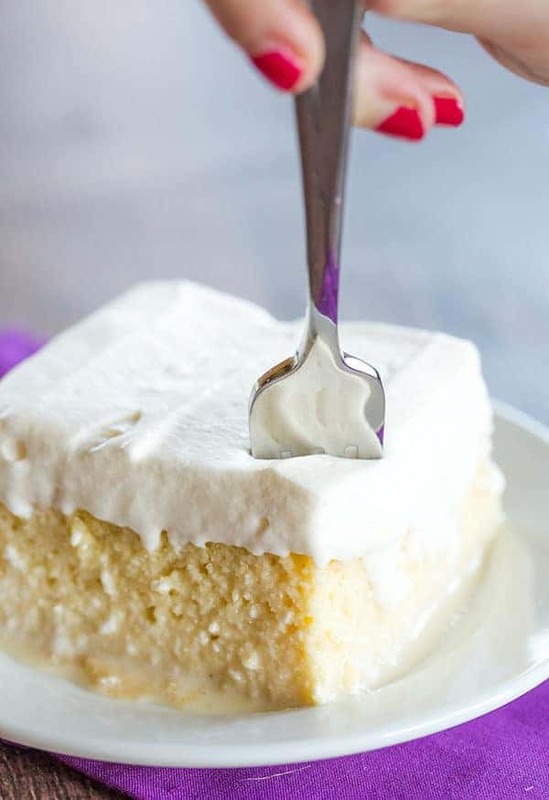 A vanilla sponge cake is baked, then holes poked all over, and a three-milk mixture (“tres leches”) poured over top. It’s refrigerated to let all of that goodness soak in, then is topped with what is quite possibly the best fresh whipped cream I’ve ever tasted. 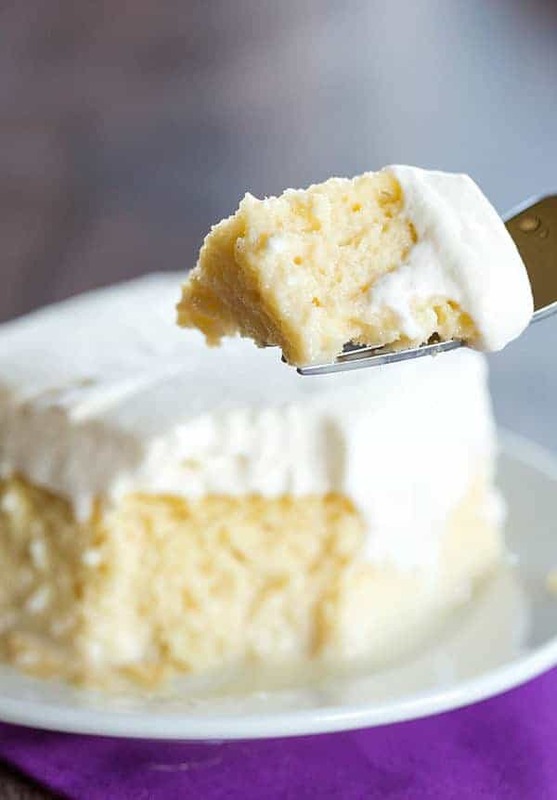 Watch How to Make Tres Leches Cake! 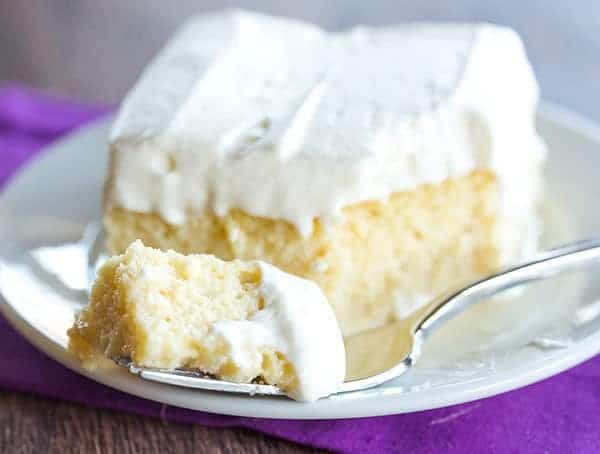 Now, I made a tres leches cake a long, long time ago and while it was good, I was convinced that there had to be a better one out there. Turns out, I was right. Not only is this one significantly more tasty, but it’s basically a two-bowl operation. No separating eggs and whipping the whites first (I loathe that step! ), just mixing it all together, then adding the flour. Can we please talk about this whipped cream? When I make fresh whipped cream it’s usually with a couple tablespoons of sugar. This recipe uses… significantly more. Which is probably why I had to restrain myself from eating the entire bowl with a spoon before I slathered it onto the cake. SO tempting. I’m sure this might go without saying, but this is a sweet dessert. It’s a great way to cap off a spicy Mexican meal, and is probably best enjoyed with a cup of coffee to go along with it (so says everyone in my family who drinks coffee). This king of all poke cakes deserves a permanent spot at your Cinco de Mayo celebration! 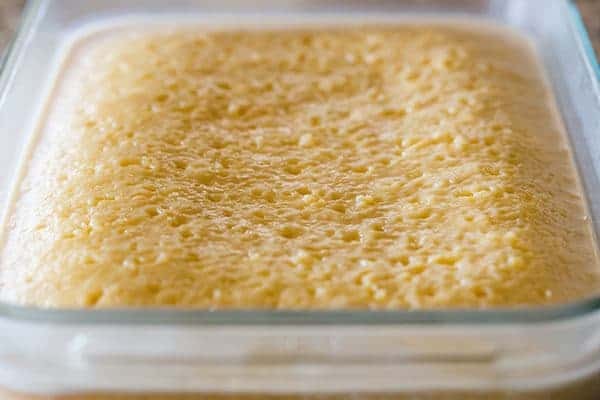 Make the Cake: Preheat the oven to 350 degrees F. Grease a 9x13-inch baking pan; set aside. Bake for 20 to 25 minutes, or until the cake is lightly golden and reaches an internal temperature of 200 degrees F. Remove the cake to a cooling rack and allow to cool for 30 minutes. Poke the top of the cake all over with a skewer or fork. Allow the cake to cool completely and then prepare the glaze. Make the Three-Milk Glaze: In a 4-cup measuring cup, whisk together the evaporated milk, sweetened condensed milk and the half-and-half. Once combined, slowly pour the glaze evenly over the cake. Refrigerate the cake for at least four hours, or overnight. Make the Whipped Cream: Using an electric mixer, whisk together the heavy cream, sugar and vanilla on low speed until stiff peaks form. Increase to medium speed and whip until thick. Spread the topping over the cake and allow to chill in the refrigerator until ready to serve. Leftover cake should be covered and refrigerated for up to 1 day.